When looking for examples of those who are talking the talk and walking the walk when it comes to their dreams, they don't get any more real than Tray Chaney. He has been used to the public eye since he was a young boy, and now with feature films, a budding music career, an autobiography and a celebrated role on HBO's The Wire under his belt, the future just continues to look brighter. Tray took out time out of his busy schedule to talk about his evolution as a man and entertainer, and why he is supporting projects like The Write Stuff Literacy Campaign in an effort to give back to those who are looking for something better in their lives. Here is our conversation. Tray, thanks for taking out the time to talk with us. You have achieved so much in your life from an early age. Are you surprised at how quickly things have come your way? Well, I feel as though I really put in alot of hard work, time and effort throughout the years. I been in the entertainment industry since I was 8yrs old. To be able to get recognized through out the world for some of my achievements such as starring on one of the biggest shows that ever hit television (The Wire) portraying the character "Poot" and also having an inspirational Book out titled The Truth You Can't beTRAY" is defitnely a blessing from God. The only reason I am not all that surprised at how quickly things have come my way is because I am a firm believer in God, and I work very hard and take this job serious and thats what it takes to achieve goals. Take us back to Tray Chaney as a child. Did you always know you were going to achieve big things? Well I did have a strong support system behind me such as my parents, family members, the community. When individuals see that a child has something that he or she is trying to do on a positive note usually you can get that strong support. I always dreamed about achieving Big things, and its defitnely nothing wrong with dreaming. I still dream, so to answer your question YES I did feel like one day I will become successful the older and more mature I get. What about your family? 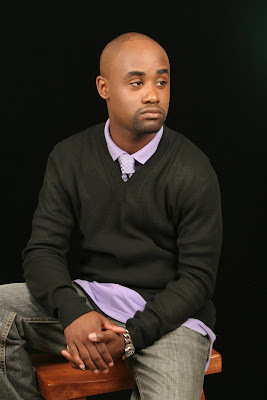 It seems like from the video on your website www.traychaney.com that your family has been supportive of your dream from the beginning. Has that always been the case? Yes that has defitnely been the case. I am truly blessed to have the parent I have. My parents always taught me to be humble at the same time determined to achieve my goals in life. They also taught me that education has to be taken very serious if I was going to be pursuing a Career in the entertainment industry PERIOD. They were very Firm when it came down to getting my education. They have truly provided for me as well as Supported. You have gone from performing on television at the Apollo to being on HBO's The Wire. What would you tell those who want to enter the entertainment industry about your experience that could help them? Honestly I would tell them to never take the word NO as an answer. Study your craft. Studying your craft could mean furthering your education on what it is that you are pursuing by taking Classes, just really staying humble and devoting your time as well as energy. Dont ever get discouraged because once that happens that can really throw your focus off and you defitnely dont want that to happen. Always realize this business is Tough, so you have to stay Strong. We all have role models that we look up to or emulate. Who has that been for you, and how does it feel to now be a role model for others. I really look up to Don Cheadle Not just for his great acting but because of the things he does outside of acting as far as his community affairs. This Man is really concerned about worldwide issues. I have a deep respect for Don Cheadle. Its so many role models that I look up to. I put it this way, anyone that is bringing positive energy to the world I look up to them. For me to be someone's role model is amazing. I just feel if I continue to stay positive and inspire the world, other individuals that look up to me will follow the same path. On top of everything else you are doing, Tray, you are also a published author. Tell us about the book The Truth You Can't BeTray and what led you to write it? 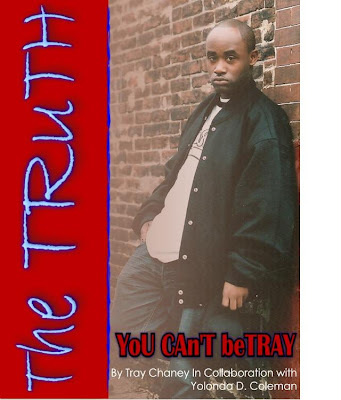 "The Truth You Cant beTRAY" is my self published Book. Its my autobiography. The book takes my readers on a journey of how I started in the entertainment industry. Trials and Tribulations I had to face. Its an Inspirational/Motivating Tool for Individuals to strive for there dreams. The book has No Profanity/Cursing what so ever. I wrote the book as if I was having a conversation with someone. Its nothing technical about the book at all. What led me to write it was its not hard to see we live in a world where people have no morals. Its so much crime, violence, and negative issues going on. I dont feel like I can save the world but at the same time I just wanted to put something positive out to show individuals that they can have a positve side to them. The book is available at www.amazon.com using the keywords Tray Chaney..
What do you hope people learn about you from the book, and who do you think would best benefit from reading it? I want people to learn that no matter what you can overcome trials and tribulations. Strive for your Dreams. Its certain choices we all have to make as human beings. I feel anyone no matter what age you are can relate. Its hard to say who it would benefit. I have young people from the early age of 8yrs old telling me they love the book. Then I turn around and a 60yr old person says that the book helped them to appreciate certain things that are in the the book. That was my point in writing it for all ages...I wanted everyone to be able to relate to something. Reading is something that does not get alot of attention. In fact you and I met because of our literacy campaign called The Write Stuff. What do you think we can do to encourage more young people and even adults to read? To encourage young people as well as adults to read we have to find a way to capture there interest. Really dig deep down into what it is they are interested in and provide it for them. I was even thinking setting up programs/seminars with different topics to read about whether it be entertainment, sports, health conditions, learning how to cope with different worldwide issuses. We really have to capture there interest. I am in the process of turning my book "The Truth You Can't beTRAY" into a film. I am giving anyone that purchases the book at www.amazon.com a chance to audition for the film. I am self-published so I can make those type of decisions. I have a movie that just came out in stores (Walmart, Target, Blockbuster, etc) called "What We Do" starring myself, Freeway, Young Gunz, Omillio Sparks, E-ness. Its directed By Tron Anderson..I am currently shooting a film called "The Conversations" directed by my hometown friend from Washington,DC Frank Jackson. I am also currently in the studio working on my new album "Jack of all Trays" I have 2 singles from The album that me and my team are pushing called 'Dilemma' feat Jazz of Druhill and My International/Rythmic Record called 'Baby Lets Go' feat G-Mann w/ Cherri. You can find both of the records on my blog www.traychaneyblog.tumblr.com or Youtube I am all over the internet. Thanks again, Tray, for your time. If our readers want to find out more information about you and your projects, where can they find you online? My site is www.traychaneyblog.tumblr.com. You can also look me up at www.twitter.com/traychaney and Facebook. I am here for my people/fans.